US Supreme Court Associate Justice Stephen Breyer on Capitol Hill in March. 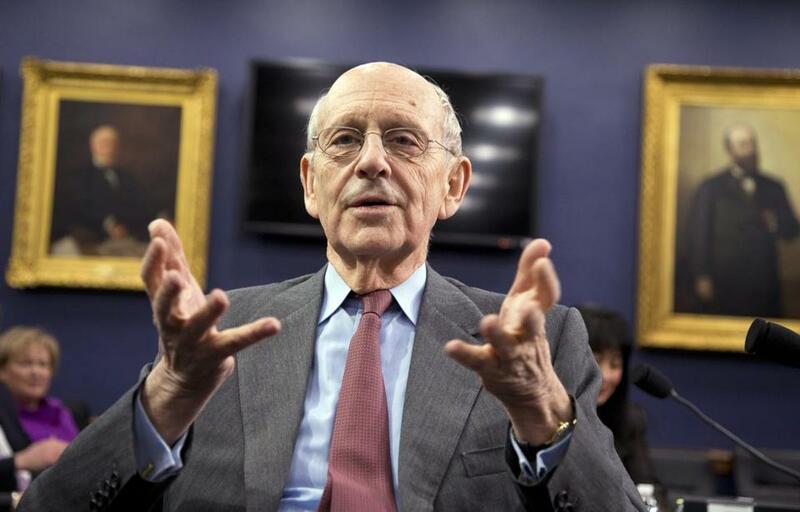 WASHINGTON — Supreme Court Justice Stephen Breyer isn’t planning to retire anytime soon, but he doesn’t hesitate when asked about his legacy after more than two decades on the bench. Breyer said in an interview that doing his best means trying to explain how the court works in a way that people who are not lawyers can understand. His latest effort is a new book, ‘‘The Court and the World,’’ in which the justice argues that the best way to preserve ‘‘basic American ideals’’ is to understand the world in which we live. Breyer, a 77-year-old grandfather with a professorial manner, is one of four justices in their 70s or 80s. But he said he is not yet thinking about retiring. ‘‘I think I would prefer to retire than the alternative,’’ he said in a telephone interview Tuesday amid a publicity tour for his book that has ranged from an appearance on CBS’ Late Show with Stephen Colbert to a column in The Wall Street Journal. Breyer has raised his profile in recent months, beginning with his surprising call for a reappraisal of the death penalty amid concerns about executing the innocent, its arbitrary use, racial discrimination and decades of delay. Breyer made his case in a dissenting opinion, one of the few he wrote in a term in which he was on the winning side more often than anyone else on the court. One of the death row inmates from Oklahoma who lost his appeal in the court’s decision in June was Richard Glossip, who is scheduled to be executed on Wednesday. Breyer did not discuss the specifics of Glossip’s case. Only one other justice, Ruth Bader Ginsburg, joined his death penalty opinion and Breyer declined to speculate whether any other colleague would soon join them. For many years, Breyer has been on the winning side of the debate over references to foreign law in Supreme Court decisions, opposed by Justice Antonin Scalia and other more conservative colleagues. Capital punishment is one area in which Scalia in particular has been sharply critical of invoking the practices of other nations. But Breyer, who has written two other books, has long argued that the debate ultimately is irrelevant and now he explains why in 284 pages. The short answer: the court’s caseload involves more and more disputes with an international dimension, including national security cases, child custody fights, business cases and human rights abuses overseas. The justices can’t escape ‘the need to look beyond our shores’’ even if they wanted to, Breyer said. ‘‘The best way to preserve our basic American values in respect to democracy, human rights, commerce, and the rule of law itself, is to learn about, participate in and understand what is going on in the world,’’ he said. Educating Americans about the court might be easier if cameras were allowed inside the courtroom, he acknowledged. ‘‘On the one hand, if we had television in the oral arguments, I think that it’d be a wonderful educational experience for those who would watch it. They would see people seriously trying to do their job,’’ Breyer said. On other hand, he said, ‘‘there are risks,’’ including elevating the importance of the interactions between justices and lawyers because decisions rest mainly on written submissions. Breyer also worries, as do the other justices, that their comments could be taken out of context. Still, Breyer said he suspects that Supreme Court sessions will one day be televised because new, younger justices will be more comfortable with cameras. He joins a parade of justices who have made the rounds of news shows and even some late-night appearances to hawk their books in recent years. Justices Clarence Thomas and Sonia Sotomayor wrote memoirs of their rise from poverty to the nation’s highest court. Scalia has co-authored a couple of books aimed at lawyers.